My time is being devoted more to care giving as my wife Joan’s Alzheimer’s continues to progress. She had been diagnosed as having dementia of the Alzheimer’s type in February of 2012. Actually I had become aware of a memory decline as early as 2004 when we moved from a single family home to a condominium. At that time she had begun asking what she should wear for an outer garment when we went outside, something she had never done before. There were other signs. Finally it came to a head when she went in for a routine physical checkup and her blood pressure had gone off the chart. She had been taking a medication for high blood pressure for years which did a good job of controlling the condition but her memory had declined to a point where she could no longer manage her prescription medications. That is when she had been tested for and diagnosed as having Alzheimer’s. Since that time she had been taking two prescriptions which are to slow the progress of the condition. These prescriptions are very expensive and their effectiveness is questionable. In order to take some of the load off myself we are are now attempting to make use of our long term care insurance. We are finding that purchasing such insurance twenty years ago had been easier then trying to make use of it when we need it. I’m also learning something about myself when it comes to doing housekeeping tasks. One thing is that it is more challenging than what I had assumed. Another one is that I found I like the food preparation part of it, cleaning and laundry, not so much. 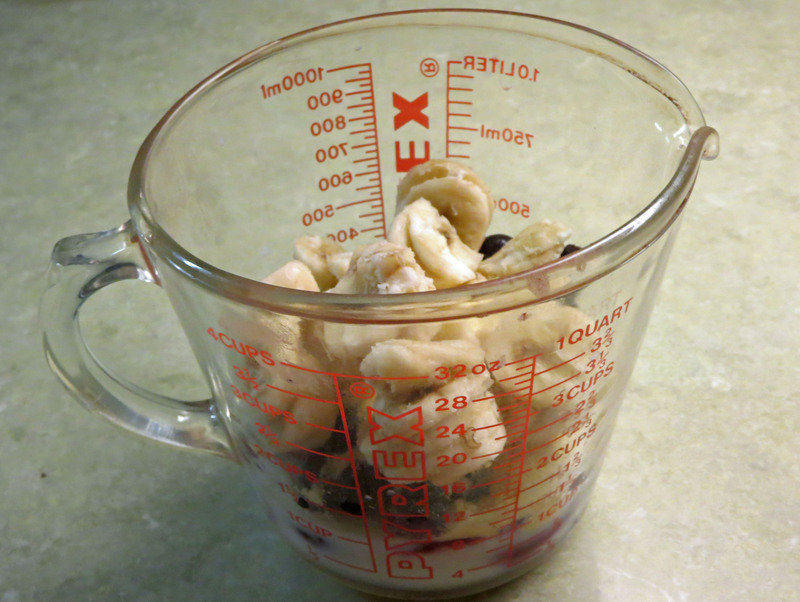 Place ingredients in a four cup measuring cup in the order listed. 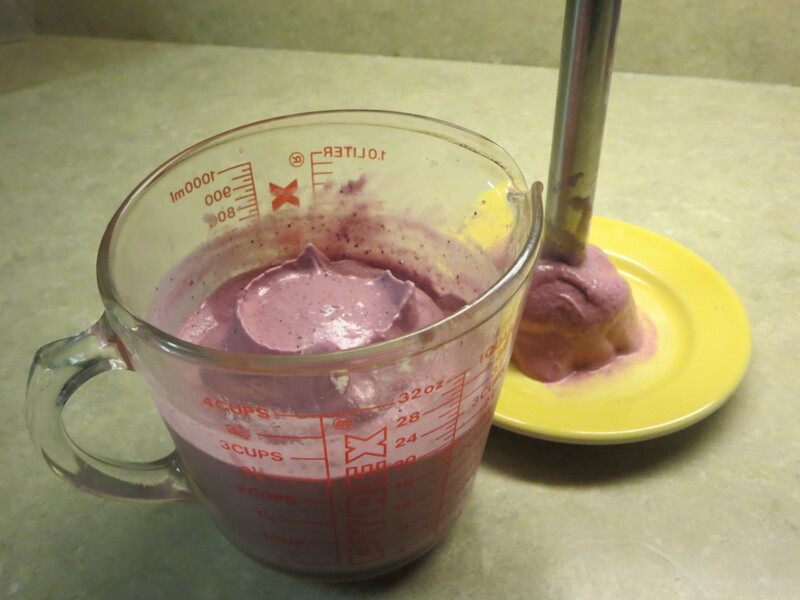 Wait approximately five minutes for the fruit to soften before mixing with a hand blender. Blend until it has the consistency of soft ice cream. Place in serving glasses or bowels. 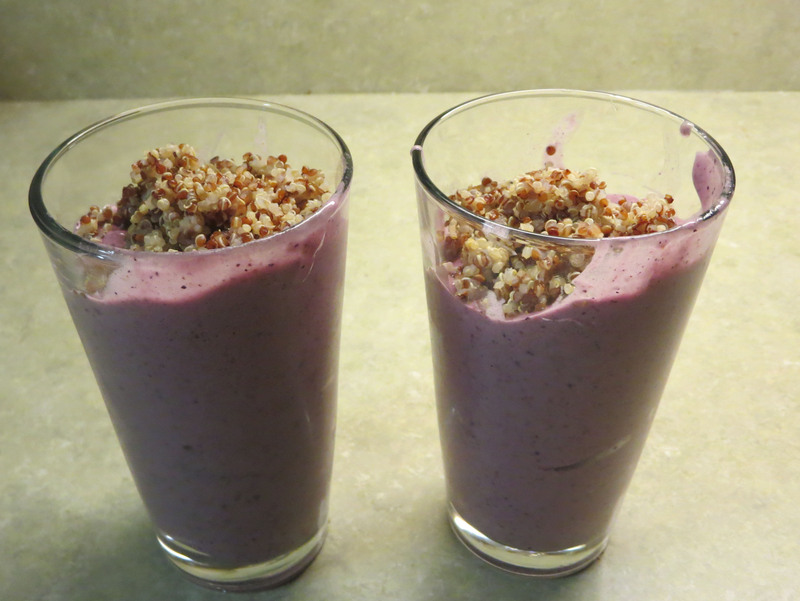 Optional, garnish with quinoa or similar ingredient.